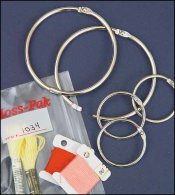 1 1/2 Rings, Pack of 6 for Floss Organizers  - $4.00 : Yarn Tree, Your wholesale source for cross stitch supplies. Item 2606. 1 1/2" Metal Split Rings, Pack of 6. 1 1/2” split rings. Nickel plated steel. Retail package of 6 rings per pack.